Today’s #Morethanfootball Action Weeks focus day is on the support of refugees and the work the football family is doing in using the power of that football to help refugees integrate into society and overcome barriers. Today, nearly 66 million people are displaced by conflict, violence or persecution with around a third having fled across borders as refugees. According to a report published by the United Nations High Commissioner for Refugees (UNHCR), despite a decline in the number of refugee and migrant arrivals in Europe, the dangers they face have sometimes increased. Beyond the issues related to the distribution of refugees, there is also the question of their integration within the host countries. The difficulties faced by newcomers are many, such as language barriers or lack of social relationships. Football is a universal language, conducive to the creation of social cohesion and the integration of refugees, can allow refugees to practice the language of the host country, build relationships, register in a group and acquire new skills. 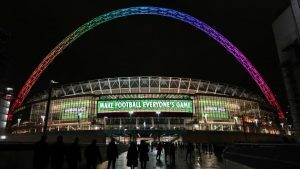 A number of EFDN members, and the network’s strategic partners have shown their belief in football as a tool for integration by implementing diverse programmes. 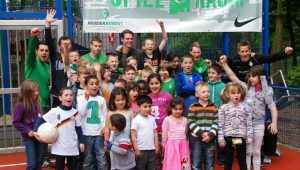 The, EFDN launched the ‘Welcome Through Football’ programme in collaboration with member clubs Werder Bremen, Apollon Limassol, KAA Gent, Everton FC, Vitesse Arnhem. The co-funded programme by Erasmus Plus will run for 12-months with the purpose of sharing expertise, experiences and best practices on community programmes which have a focus on young refugees from the ages of 7-25 year old. The 5 clubs each currently have their own football-based community programmes focusing on social inclusion, integration and acceptation of refugees in their region and Europe and one of the key outputs from the programme will be the development a comprehensive football based social inclusion methodology which will be first tested in the 5 collaborating countries with a view to inspiring and supporting other professional grassroots clubs wanting to start their own activities and programmes for refugees. This March, Bayer 04 joined a new UN Refugee Agency campaign “2 billion kilometres to safety. Every step counts” calling on people to show solidarity with refugees by running, jogging or cycling. Bayer 04 Leverkusen supported the campaign as part of a home game against SC Freiburg. Along with other Bundesliga teams, Bayer 04 symbolically tracked the kilometres run by the players during their game. 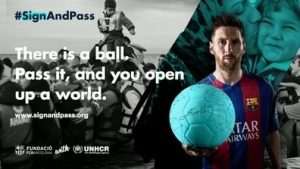 Last year, the Barça Foundation and UNHCR, the UN agency for refugees, launched the #SignAndPass campaign to invite the world to stand with refugees. The campaign is inspired by Barcelona’s football philosophy where one-touch, short passing between players has been a hallmark of their recent success. Supporters can digitally sign a football online and then pass it to their friends via social media. By signing the ball supporters add their name to UNHCR’s #WithRefugees petition which calls on world governments and fellow citizens to make sure all refugees can have a safe place to live, receive an education and are able to work so they can provide for their families. Lionel Messi and Neymar Jr showed their support for refugees and joined the campaign in this exclusive video (click the image). The FC Barcelona Foundation also implemented the FutbolNet programme in refugee reception centres in Greece, Italy and Lebanon in July 2017. The program uses sport to improve social skills, conflict prevention and conflict resolution among refugee children and adolescents, to enhance their emotional well-being and to foster their social inclusion in host countries. Also, a “Sports kit” has been developed with the help of the FCB’s Innovation Hub. It includes innovatively designed sports equipment and operating instructions that can be used in refugee sites all over the world, regardless of cultural, climatological and environmental considerations. 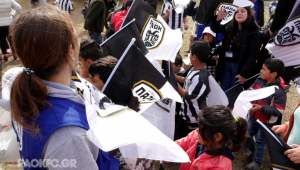 PAOK Action (CSR department of PAOK FC), introduced a programme aimed at supporting refugees, people in need and children that are struggling to survive on a daily basis. The #WithRefugees programme includes the coordination of providing basic material to refugees. The first step of the extended programme was made on 7th of February 2017 on the refugee hosting site of Alexandria Imathia in cooperation with UNHCR and supported by the Ministry of Migration Policy and its Regional Asylum Office of Northern Greece and Eprius. The Community Trust staff worked in partnership with Amnesty UK to give the group a day they’ll never forget. 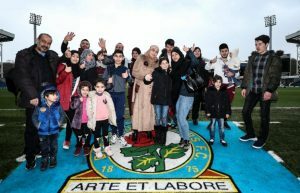 The club hosted a stadium tour for a number of refugees and asylum seekers who were based in Rossendale. The group were taken behind the scenes of all areas of the ground and then enjoyed the chance to play football at the Blackburn Rovers Indoor Centre. The group took in the sights of the home changing room, the historic boardroom and the Jack Walker statue. They then had a trip to the trophy cabinet to take a look at the Club’s finest hour in the Premier League trophy. 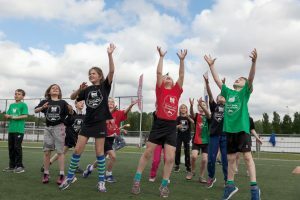 ‘Willkommen im Fußball is a programme founded in 2015 by the Deutsche Kinder- und Jugendstiftung (DKJS) and DFL Foundation as an alliance of 23 German clubs from the 1st and 2nd Bundesliga with a focus on the process of integration of young refugees by emphasising different topics like sports offerings for refugee girls and women, educating young refugees for volunteering in grassroots football clubs and connecting refugees to the job market. These again are just some examples of the excellent programmes and initiatives supporting refugees and again showing that football really is #Morethanfootball.